Not far into the woods, just around a nice park in town with lots of tall trees and rhododendrons. I’m unfamiliar with this park, so I downloaded a map to my phone so I could find all the trails. I’d never realized there were so many! Happily, I enjoyed a good hour of just traipsing around, up and down the hills. Whenever a trail came out on a residential street I backtracked so I could continue my forestral jaunt. I don’t even know if forestral is a word, but I’m using it. There were moments when the scene around me really stopped me in my tracks. Moss covered branches, glorious Doug Firs and sprawled out ferns were everywhere. I loved one spot in particular where the trail turned away nicely and the grayish light filtered through the branches from the overcast sky. Deciding I needed to share this beauty with my friends, I took a photo with my phone and immediately posted it online. At one point, I found myself on a very narrow trail with old mashed down wood chips. They were weathered and had obviously been there awhile. Plenty of spider webs caught my arms and face as I pushed my way past overgrown branches and stepped over fallen trees. It seemed to be a forgotten, barely used part of the trail. For a moment I forgot I was still in the city. I couldn’t see any houses or hear any cars. It was just me and the trees and a few critters rustling through the underbrush. My thoughts were bouncing all around, but I was enjoying the quiet and solitude. It was so startling I jumped. Frantically, I yanked off my pack and pulled out my phone, instantly hating my choice of ringtones. I didn’t recognize the number so I cancelled the call without answering. A moment later, I checked and, sure enough, the unknown caller had left a message. I stopped to listen to it, just in case, but it was only a car salesman telling me he was responding to my request for information (which I hadn’t requested). I only listened to the first few seconds of his voicemail before hanging up and deleting it. It was nearly a minute long and he said he would be sending me an email. Right then, my phone beeped an email notification. Gah! I opened it and replied with a nicely worded “I’m not interested” message. Really . . . it WAS nice. I said please and thank you and everything. I wanted to release my unholy wrath on this man. I mean . . . how dare he interrupt my moment?? But it wasn’t his fault; he was just doing his job. Apparently, I’m in some database somewhere from when I bought a car two years ago in Portland. Car lots contact me every so often and I always just politely send them on their way. This time, I began to really feel frustrated and my mind began to spin with the thought of how many times I’ve been contacted by car salesmen. It’s been TWO years for crying out loud! Leave me the eff alone! My blood pressure was rising and I was beginning to wish I HAD unleashed on this guy. 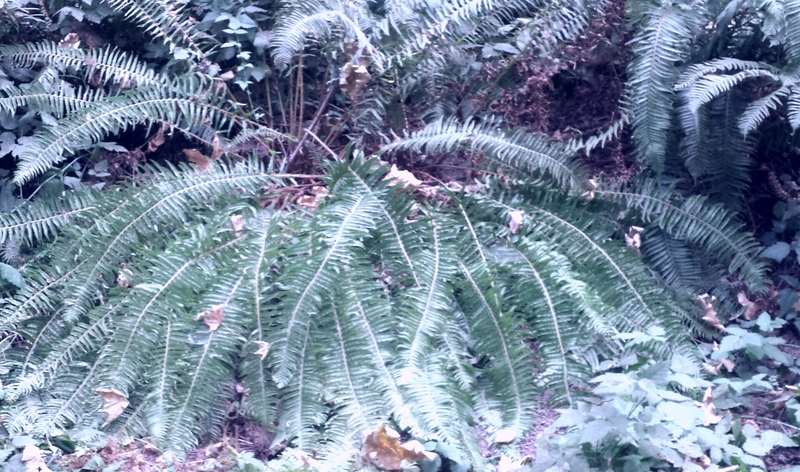 Ferns in Hendricks Park, Eugene, Oregon. I decided for the sake of my sanity, I needed to find my way back to my quiet moment. Ahead of me in a curve of the trail stood an inviting tree so I stopped in front of it, put my hands on the side and decided to focus on being “in the moment”, like a Buddhist meditation. Placing my hands against the bark (after checking for spiders), I began with a deep breath, filling my lungs and holding it for a couple seconds. On the out breath, I pictured releasing my tension, letting the tree take it from me, absorb it up into its branches and letting it go into the gray sky. For some reason, this triggered an avalanche of emotion in me and I found myself standing on a path, leaning against a tree, shaking and crying. I forgot to control my breathing and just sobbed for a moment. At first I just bawled, then there was guilt that I was dumping this on a tree. Seriously . . . GUILT . . . poor tree! I decided the tree could take it and I let myself continue to release the anxiety and even added a touch of fear to what I was letting go. As the emotions faded, my sobbing subsided and I became embarrassed, hoping no one saw or heard me. I stopped myself right there and decided that taking care of myself was more important than whether or not some stranger thought I was weird. Plenty of people I know think I’m weird and they still like me, so I said eff those guys and continued to cry and hold onto the tree. As I breathed in, I visualized taking in strength from the tree and peaceful energy from the forest around me. Oh my gosh, it was amazing. I was really feeling this stuff. Slowly, I breathed out again, almost afraid to trigger another avalanche. I just felt calm. My eyes were wet, my heart a little sore, but I felt better. My pulse dropped to normal and my breathing became deep and healing. Patting the tree gently when I was done, I looked up into the upper branches, and felt deeply grateful to it for letting me cry on its bark. It stood solidly and supported me with no judgment or advice or attempt to fix anything. I dropped my hands, looked around, took one more deep breath, turned off my phone, and continued on my hike. All this time the tree huggers had it figured out . . . and now I know, the trees hug back.